Cuore di Venezia: Palazzo Ducale, Basilica, affascinante giro in gondola e tour panoramico! Evita le code alla Basilica di San Marco e al Palazzo Ducale e opta per una visita guidata in comune. Quindi, goditi la quintessenza dell'esperienza veneziana: un giro in gondola tra i canali e i canali della città. 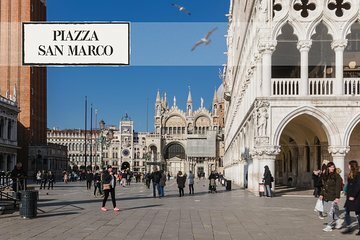 Il biglietto include anche l'accesso a diversi punti di riferimento che circondano Piazza San Marco, così come l'accesso a un'app mobile che fornisce un commento a un tour a piedi della città al proprio ritmo. This tour package was very good and I would recommend it. The actual tours were excellent and our tour guide Rosanne was very good. She spoke clearly and shared a lot of interesting information and handled the group respectfully and well. It was great that she did both the tours so we just seamlessly moved from one to the other. She looked after one person who needed an elevator for the one set of stairs we encountered. There were a lot of people lined up in the square in two lines. It wasnt clear which line was to check in and which was to get the audio receiver. Perhaps the signs could be made clear. Men can wear shorts but the information said not to wear shorts. Suggest you drop this from your written information as my husband wore long pants on a hot day unnecessarily. The Check in person took the first page of our confirmation material and didnt give it back. That meant we had no way to show the Gondola tour manager proof of purchase later in the day. Fortunately I had a second copy which I could use. Not sure what I would have done without that second copy. Perhaps you should hand out a gondola ticket at the first check in. Also suggest have a cooler with water bottles to buy.